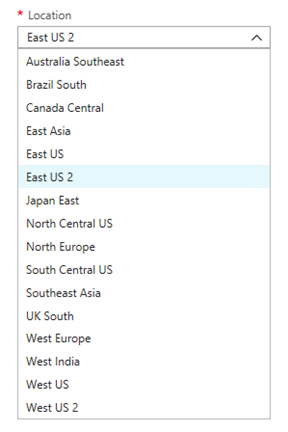 As announced earlier, Power BI Premium now supports Multi-geo (Preview). 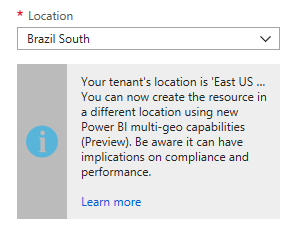 Based on the same feature set and limitations, Multi-geo is now available for Preview to customers using A capacity for Power BI Embedded. 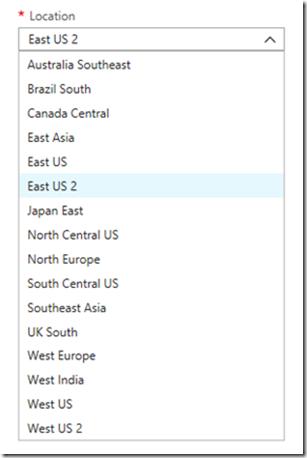 Learn more on Multi-geo capabilities and supported regions. In the ‘Create resource’ blade, you need to choose the location of your capacity. 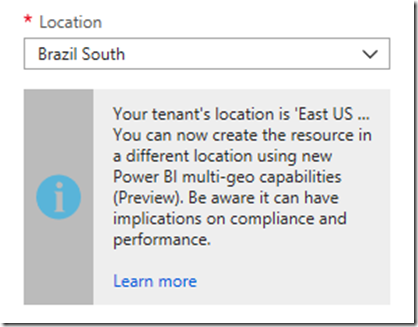 Until now, it was limited only to the location of your Power BI tenant, so only a single location was available. With the release of multi-geo, you can choose between different regions to deploy your capacity. Notice that when opening the location drop-down menu, your home tenant is the default selection. When choosing a different location, a message will be prompted to the user to make sure he is aware of his selection and the implications. Learn more on how to create a Power BI Embedded capacity in Azure. You can see your capacities location easily when going to the main Power BI Embedded management page in Azure portal. It’s also available in the Admin Portal in Powerbi.com. In the Admin portal, choose ‘Capacity settings’, and then switch to ‘Power BI Embedded’ tab. Once created, the location of Power BI Embedded resource cannot be changed, as other Azure resources. In order to move your Power BI content to a different region, you will need to create a new capacity in the desired region, assign the workspaces from the existing capacity to the new one, and delete or pause the existing capacity. It’s also important to be aware that deleting a capacity without re-assigning it’s content, will move all the content residing in that capacity into shared capacity, which is in your home tenant. 1. ‘Get Capacities’- The API returns a list of capacities the user has access to. The response will now include additional property called ‘region’, that will specify the capacity’s location. 2. ‘Assign To Capacity’– The API allows assigning a given workspace to a capacity. This operation will now allow to assign workspaces to capacity outside of your home region or move workspaces between capacities in different regions. To perform this operation, the user still needs admin permissions on the workspace, and admin or assign permissions on the target capacity. 3. ARM API– all of the ARM API operations, including ‘Create’ and ‘Delete’, will support Multi-geo.